Fun With Puzzles Brain Teasers Kids Puzzles Puzzles Riddles Riddles for Kids What am I Riddles Word Puzzles Riddle for Kids: What am I? Riddle for Kids: What am I? This What am I Riddle is for school going Kids. This is very simple and easy riddle. 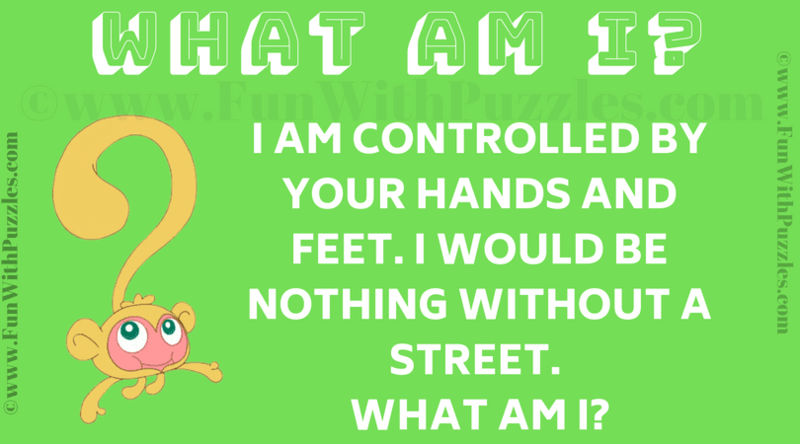 In this riddle you have to think and name of something which is controlled by your hand and feet. Can you solve this easy riddle and find out what am I? Can you solve and find out What am I? Answer of this "Riddle for Kids: What am I? ", can be viewed by clicking on answer button. Please do give your best try before looking at the answer. The Answer is Car or other Vehicles. Correct. Better answer to this What am I? Riddle will be Vehicle.